sounds great.. Looking forward to the beta..!!! Great work!!! 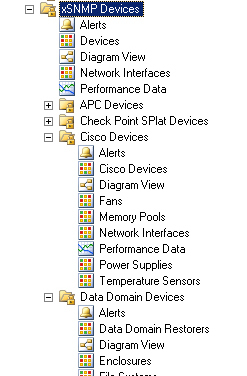 I was actually in the process of changing the Cisco SNMP MP to discover and monitor Dell PowerConnect switches. The direction that you are taking the MPs sounds great. Would you be open to structuring the effort as an open source project so that others can contirbute? Thanks for the comment. As for open sourcing this, I can say the following. Each version (beta and production) will be released under the GNU GPL license, with source code (in the form of unsealed MP’s) provided in each release. I also have plans to create documentation on using the reusable datasources in the core MP to standardize development of additional MP’s. So, at any point, anybody will be able to download, extend, modify the MP’s to their requirements. I would like to see the MP’s go through a good public beta period and some code maturation before formalizing as a community-type project. My reasoning for this is that if changes are required in the core MP, they can easily affect compatibility with dependent MP’s. I’d like to try to get to a point of pretty frozen code on the core MP before encouraging community development. I also need to work out a plan to manage the community development process. I’m always open to suggestions though. Great work Kris. I am really looking forward to this. Is there any ETA on when the new MP will be available to the wider community to test? I’m really looking forward to your public beta. I’m currently using SolarWinds to monitor our network and unix elements and would really like to end up at one solution. Public Beta Whooo Hooo !!!! This is a GIANT leap forward. “The very bestest” russian-like speaking manner. Some of the best work I have seen, excellent job! great management pack, but i have some problems with Brocade Management Pack i would like to share. after adding AS400 devices, some ports are not discovered. and i am not able to monitor. also, it did not discover the Virtual Cards, it is only discovering hardware. Thank you for this MP! Great work! But I have one problems: I not understand how I can monitor “tunnel” interfaces on Cisco routers. People, please help me setup MP for monitor tunnel interface. Hi. Is it possible to get this MP working in OM 2012?